In Heirloom, Sarah Owens’ efforts to introduce cooks to using locally grown, “heirloom” food is commendable, and she writes eloquently and passionately about the benefits of doing so. A lengthy introduction leaves the reader fully informed as to why Owens prefers this kind of food and cookery, despite the sometimes overblown descriptions and statements describing the relationship between humans and food consumption. The recipes here are organized in two parts – by type such as fruits & vegetables, meats, and grains, then by season, which is helpful and supports the narrative style of the text. There’s some definite “Earth Mothering” here, with recipes and instructions for making your own vinegar from carefully selected plants, and fermenting food which, let’s be real, regular people are probably not going to work into their busy lives, even though the recipes are totally fascinating! And that leads me to my main criticism of this book – it is definitely written from a place of privilege. There’s little to no understanding by the author that many Americans live in food deserts, where they can’t easily access fresh food, and certainly can’t afford to pay for some of the ingredients used here. That said, this will find an audience with the semi-affluent to affluent Moms who are trying to get their families to eat healthy. The Philosopher’s Flight by Tom Miller – Imagine a world where the patriarchy is flipped. Where women who have unusual skills (think those traditionally associated with “witches” like flying, healing, and magic) have shaped the world and women have the power. Now imagine that the son of one of the most decorated “Philosophers” wants to join what seems to be the equivalent of the Air Force, but to do so he must graduate from the Philosopher program at Radcliffe, where he one of only 3 men. At the same time, the Philosophers are threatened by the “Trenchers” who believe the skills possessed by the Philosophers are evil. And that’s only the tip of the proverbial iceberg. Miller has built a world that is at once familiar and topsy-turvy, and made that world a whole lot of fun. There’s unbounded humor and imagination here along with plenty of breathtaking excitement. Highly recommended. Edna Lewis: At the Table with an American Original – If you pick up this book expecting it to be a cookbook, you’ll be disappointed. If you’re looking for a highly readable collection of essays about a remarkable woman, this is your book. Yes, there are some recipes, but they are superfluous to the story told here. Edna Lewis is the star, and food her supporting actors. This collection of essays and reminiscences about Lewis, who passed away in 2006 after decades of holding court as the Queen of Southern Cooking, is a beautiful testament to a woman who successfully introduced real Southern Cooking to the masses. Cooking in a time when food was “complicated,” Lewis made her mark and built her audience by staying true to simple recipes using the freshest ingredients. Along the way, she influenced countless chefs and cooks. This book collects their stories, each one unique and interesting. Recommended for curious cooks. A Well-Timed Murder by Tracee de Hahn – I stumbled upon de Hahn’s first Agnes Luthi book, Swiss Vendetta, quite by accident while browsing in a book store one day. I took it over to a comfortable chair to read a few pages and was hooked after the first chapter. I’ve waited for this, her second in the series, with much anticipation and I was not disappointed. Agnes returns with the same quiet, sturdy, wry spirit, despite the injuries she sustained at the end of Swiss Vendetta. We learn more about Agnes and her family here, as well as about Julian Vallotton, as the two investigate the death of a master watchmaker. I have a fondness for mysteries that include well-researched information about unusual topics; in this case, de Hahn delivers some fascinating information about the Swiss and international watch industry. The author skillfully develops key characters, and crafts a tricky and surprising plot which fully engages the reader. Tracee de Hahn is quickly becoming a new favorite author and Agnes Luthi a favorite character. Highly recommended. I am a cookbook reader and collector, and the concept behind Foodimentary intrigued me. Every day a Food Holiday? Hell, yes! I was not familiar with the author’s blog so opened the book to a cold read through. I found the introduction, where he describes the “a-ha” moment when he discovered the word “foodimentary” and how he built his blog just a little too precious and uninteresting, but I am *not* an “Introduction” reader and usually skip them, so no matter. What does matter is the content of this marvelous book! Hopkins has produced a readable, fun book filled with interesting facts about food and 365 reasons to celebrate it. I’m not entirely clear on how he selected the Food Holidays, but I do like his flexibility in changing them up and his encouragement to readers to decide on their own food holidays. The food holidays described in the book are fascinating to read and will be a blast to celebrate. Since reading this book, I have celebrated Stuffed Mushroom Day (Feb 4), Oreo Cookie Day (March 6), and Potato Chip Day (March 14). There are so many possible uses here – in classrooms, libraries, and most certainly bars & restaurants. The book itself is big and chunky, and filled with retro illustrations that remind me of old cookbooks. I haven’t tried any of the recipes yet, but am looking forward to testing a few. This would make a wonderful gift for the foodie in your life, and there is tremendous potential to connect with the author through social media and share your pics of how you’ve celebrated his Food Holidays. Recommended. Phyllis Good can straighten her crown and easily claim the title of Slow Cooking Queen with this, her latest entry in a long trail of slow cookery cookbooks. Stock the Crock contains hundreds of recipes for old favorites with new twists, all using your crockpot. Divided into seven chapters – Soups, Stews & Chowders; Vegetarian & Pasta Mains; Poultry; Beef & Pork; Fish & Seafood; Sides; and Sweets & Treats – this book has something for everyone. Good writes clearly, listing the ingredients in the order in which they are used, and uses everyday ingredients that most American cooks will have in their pantries. She also emphasizes the flexibility of cooking in a crockpot, often letting us know things like: “If you don’t have time to brown the meat before adding to the pot, don’t worry. It will be fine,” or “If you’re not there to stir the pot after 2 hours, don’t worry. It will be fine.” I love that. I did learn some new things from this book, like Good recommends you grease the interior of your crockpot before you add the food. I’ve never done that, and I do wonder if it’s necessary. I also learned that you can BAKE in a crockpot, too, although again, I wonder who would want to do that. There are some excellent recipes here – some that I tried and found delicious, and some that I plan to try soon. For example, Salsa Rice. Did you know you can cook rice in a crockpot? Rice is my cooking Achilles heel. I never get it right. Cooking it in a crockpot, though? Perfection! Good also provides recipes for homemade Cream of Mushroom and Chicken Soup, which are wonderful. Cider Baked Apples – sublime. I plan to try the Butternut Squash Soup with Apples & Red Onions, although I am quite certain I will be the only one in my home to eat it. Good adds some extras to each recipe that make this book even more versatile. She provides instructions for making recipes gluten-free, vegan, or vegetarian, as well offering tips for making the recipe for picky eaters. She also specifies the size of the crockpot needed for each recipe, which is a huge benefit (those of you who have tried cooking a turkey in a 4 quart pot will understand), as well as prep time estimates, and cooking time. There is nothing not to love about this book. The photos are gorgeous, the instructions are clear and concise, and above all, the recipes are delicious. Highly recommended. I’ve been reading a lot lately, but not all of what I’ve read has inspired me to write a fully fledged review. Instead, here are a few micro-reviews of some books slated for publication this Fall. Cooking with fresh, seasonal produce is certainly not a new thing – experienced cooks have been doing it for years. However, as Tanis points out in this lovely, information-packed, highly readable cookbook, many cooks today are seduced by easily acquired but often flavorless supermarket produce. Tanis’ mission is to direct cooks back to their own locally produced food, which always tastes better. This title caught my eye on NetGalley because it’s CSA season, when I invariably get the odd vegetable that I’ve never cooked. I was not disappointed. Tanis provided me with tasty ways to cook parsnips, greens, and even celery root, as well as new takes on old favorites like corn and potatoes. His recipe for Creamed Corn is super simple and absolutely delicious. There is no pretentiousness here, as I often find with “cheffy” cookbooks – just simple, easy to follow recipes that rely on the deliciousness of fresh food. Highly recommended. Emily Jenkins has taken the language of old timey fairy tales and turned it upside down in this 21st century retelling of classics like Snow White and the Frog Prince. The bones of the stories remain, but each has new language, new cadence, and new sassiness in the characters, which is completely refreshing. As I read, I felt like these stories could easily turn up in an animated series on Nickelodeon. What a wonderful way to take beautiful but clunky old fairy tales and make them new again. Well done! I really tried to like this book, but it was a straight-up snoozer for me. There’s no question that Hanks can write. His prose is really quite good, but I just found this collection of short stories to be D.U.L.L. There are a couple stories built around a kernel of an idea that could be developed into full-blown books, but most are just odd and sad. It may just be that I am not a fan of literary fiction, but I have to wonder if this collection would have been published at all if not for Hanks’ fame. It will be popular and in demand, though, so libraries should buy a copy. My daughter and I have recently become meal preppers, since I always struggle to have a healthy lunch and she is just beginning her first year of a rigorous doctorate program and will be at school all day, then go right to work. We’ve had some fun trolling Pinterest for ideas, but quickly found that there’s not a lot of variety there, so I was happy to find this book on NetGalley. Tornatore and Bannon have created a readable, attractive, and easy to follow guide to prepping a remarkable variety of meals. While I am not vegan, I appreciated the inclusion of meat-free meals. I also really liked the inclusion of an equipment list for each week, as well as the Prep Day Action Plan. Another bonus is the inclusion of breakfasts and desserts. The book is filled with helpful tips and advice, and the recipes are easy to follow. Combine all that with beautiful, eye-catching photography and you’ve got a hit. Recommended. Having lived my entire life on the southern shore of Lake Ontario, I was drawn to this lovely book about Great Lakes life on the shores of Lake Superior. I was curious to see if there were similarities, despite the distance between western New York and the upper peninsula of Wisconsin. In many ways, this was like reading my own life, and I finished this exquisite book feeling as though Mary Dougherty and I are old friends. Dougherty – a former restaurant owner, blogger, Mom to 5, and activist – has written a sumptuous, supremely readable cookbook/memoir that is organized by seasons. It has been a very long time since I’ve read a cookbook that better reflects the life lived by the author, and Dougherty has done a remarkable job of connecting the food and the people of Bayfield, Wisconsin to the land and the Lake. While living in a remote, small town of less than 500 people, Dougherty has managed to stock her pantry with exotic spices and fill her kitchen with adventurous cooking, blending local with global in an appealing, delicious melange of meals ranging from Thai Corn Chowder to Whitefish in Foil. Enhanced by gorgeous photography and a chatty style, this book takes you deep into the forest and then out on the blue water of Lake Superior, through all four seasons. Dougherty is my kind of cook – while all the recipes are detailed enough for a beginning cook, she makes a point of encouraging the reader to experiment, taste, and adjust as necessary. Some of the recipes are familiar (Nicoise Salad in a Jar), but the stories accompanying nearly every recipe create a moment that makes each special. Canned potatoes – this story could have been told by my kids, who ate canned potatoes at their Grandmother’s house every Tuesday night for years when they were little. Nothing matches that consistency and taste! Penzey’s Spices – my sister gives me a box of Penzey’s for Christmas every year! Parades – community parades are a Big Deal where I live, where pretty much any group who wants to participate can walk the route, tossing candy into the crowd. Here’s a photo of the Lawn Chair Ladies taken at the Hilton Firemen’s Parade a couple weeks ago. Chautauqua – The settlers in Wisconsin HAD to pass through New York. This name is just too unusual. Chautauqua County NY is home to the Chautauqua Institute, which hosts amazing concerts and other events. Salt potatoes – totally a Central/Western NY thing! No BBQ is complete without salt potatoes and sweet corn! AppleFest – My favorite event of the year is the Hilton Apple Fest. One year, they set the world’s record for largest baked apple crisp. I bet Bayfield’s Fest has done something similar! And finally, I could not believe it when I turned the page to find my mother’s recipe for Angel Pie! I have never encountered this recipe outside of my family! It just may be that the most radical act we can commit is to stay home. Maple syrup: capturing spring awakenings in a bottle, one year at a time. Think of it at the little black dress of appetizers: always appropriate and never over done. Fall is a pause between the riotous abundance of summer and the muffled repose of winter. I never expected quiet perfection because I knew the good stuff always comes from the messy and brilliant business of living a life in a way that brings you to your knees in gratitude every now and then. Those of you who know me, know I am a maniac when it comes to baking cookies for Christmas. My baking frenzy begins right after Halloween and, by mid-December all the freezers in my home are filled to the brim with dozens of varieties of cookies. The rest of the year, I am on the look-out for new recipes, so I was happy to find this gem of a book through NetGalley. There are plenty of tips here for beginning bakers, covering baking, decorating, and storing cookies. The author divides the recipes into classics, cookies suitable for a cookie exchange, spiced cookies, cookies from around the world, cookies suitable for fancy decorating, and confections. The recipes are simple and straightforward. If special equipment is required, it’s noted clearly. These are tasty, good-for-the-soul cookies that don’t require tons of special ingredients, equipment, or talent. The recipes are accompanied by tasteful and colorful photos of cookies that look like even a beginner could make them. The writing is warm and casual, inviting the reader to give the recipes a try without judgement. I thoroughly enjoyed reading through this and saved some recipes to try this year. Is there anything better than food cooked by your grandma? Not likely, but the dishes you’ll find in this lovely book are not your typical Sunday gravy. 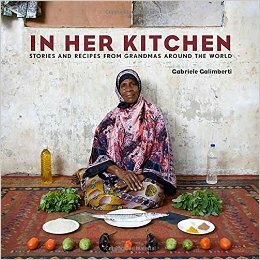 Galimberti shares a story early in the narrative about how his grandmother, who lived her entire life in the same small Italian village, was worried about what he would eat during a two-year assignment traveling the world. He realized then that he had an opportunity to explore the concepts of food and family by seeking out people just like his grandmother and looking for common ground. His journey begins with his grandmother, Marisa Batini of Castiglion Fiorentino Italy, and concludes with his mother, Paola Agnelli, a new grandmother herself. In between are the stories and recipes of women, of grandmothers, the world over. We meet grandmothers from Brazil, Armenia, Canada, Alaska, Morocco, Albania, Mexico, Colombia, Thailand, Malta, Norway, Bolivia, India, Zambia, Fiji Islands, Japan, Sweden, Haiti, and many others. We meet grandmothers who cook over open fires and high-tech ranges, who have all the amenities of the modern world or no running water or electricity, who buy their food in a supermarket or hunt and kill it in the wild. The common thread that ties all these women together is the reason they cook, and it is always family. Grandmothers who cook for their children and grandchildren, whose task is to nourish the family and make them strong. We learn about favorite recipes that have been handed down in the families for generations, treasured plates and bowls that belonged to long dead grandmothers, food and ritual that has great meaning. The admiration, respect, and love shown these women is truly touching and heartwarming. They all welcomed Galimberti into their homes and kitchens, cooked with him, and shared their food – all extremely personal actions. He, in turn, has captured the universal essence of family and food in a readable, very accessible book. My typical routine when reviewing books is to read them, then place them near my computer so I have them handy when writing the review (and so I *remember* to write the review!) In this case, I *did* forget to write the review because this book hasn’t left my kitchen! Go Fresh by the American Heart Association is packed with tasty, healthy, and easy recipes that can satisfy even the most reluctant healthy eater. Beginning with short, easy to read sections on how to build healthy eating habits, this book includes everything from how to buy and store fresh foods, to kitchen & cooking tips, to lucid, straightforward advice on how to achieve a healthy lifestyle, to dozens of delicious recipes. I really appreciate a cookbook that is written in a simple, consistent style, and Go Fresh is definitely that. The recipe layout is uncluttered and includes clear, step by step directions. Boxes listing serving sizes, prep time, cook time, and standing time appear in the upper corners of each recipe page. In addition, there are numerous “Cook’s Tip” boxes throughout the book, offering useful advice for the novice to the experienced cook. A center section of lovely, full-color photos adds a nice touch to the book. Every recipe I tried came out beautifully and all were well-received by my family. Some new favorites include: Parmesan-Spinach Soup, Citrus-Soy Tilapia, Espresso-Rubbed Flank Steak, and Broccolini with Toasted Walnuts. It was a special treat to have this book during the summer harvest season, when so much fresh food is available. I have tried many, many healthy eating cookbooks over the years and always seem to come back to those from the AHA. There are no gimmicks, no strange foods that cost the earth, or special cooking utensils required here – just good, fresh food. I highly recommend this book. Last summer, on a whim, I bought a bushel of mini cucumbers at a local farmers’ market. I reasoned that my husband, who loves cukes, would eat them, which he did – for about a week. Then I found myself with two thirds of a bushel of lovely little glossy green cucumbers that I could not bear to see go to waste. Tired of hearing me moan about what to do with this bounty, my husband uttered a phrase that changed my whole summer. So, I searched the internet and found an abundance of recipes for bread and butter pickles, brined pickles, garlic pickles, refrigerator pickles, dill pickles, basil pickles, even kool-aid pickles. While the recipes seemed like something I could manage, I found the lack of good directions a big problem. So, I headed to the library and spent a lovely afternoon browsing through cookbooks on pickles and canning, but came away feeling very intimidated. I eventually tried the simplest refrigerator pickle recipe I could find and they turned out okay. Nothing special, but certainly edible. The Pickled Pantry has changed all that. This is the book I wanted last summer. 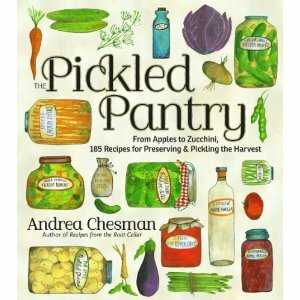 Chesman writes in an engaging conversational style, and isn’t afraid to talk about her successes and failures in pickle making. She explains why it’s important to take certain steps, but also offers alternatives for various ingredients or processes. Recipes for a variety of pickles, from cucumber to cauliflower, are presented in clear language that can be understood by a novice. As an added bonus, Chesman also profiles famous pickle makers (who would have thought there were so many!?) in appealing inserts throughout the book. The Pickled Pantry is one of those rare cookbooks that you can read straight through like a novel. I sincerely hope Chesman has other culinary expertise and will be writing more books like this one!